GETAWAYS: This B.C. 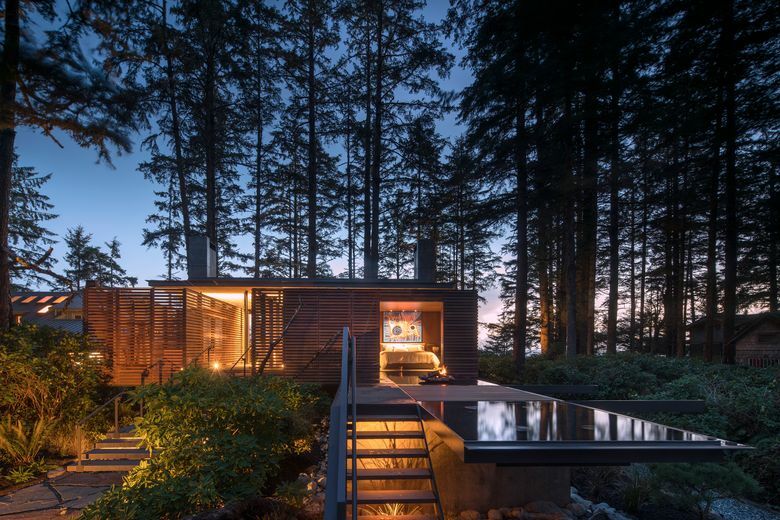 retreat snuggles into its wild surroundings — and stands out as the cover of a new monograph on the legendary Olson Kundig architect. 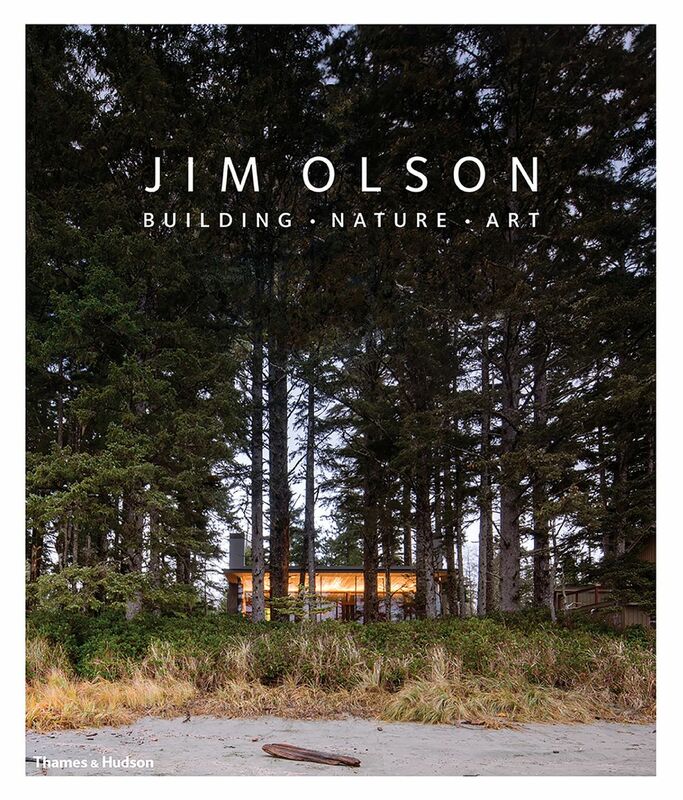 OF ALL THE PHOTOS of all the projects of an entire professional lifetime, the front and back covers of the impressively hefty new monograph “Jim Olson: Building•Nature•Art” feature images of the breathtaking Tofino Beach House in British Columbia: a remote retreat the illustrious architect brilliantly nestled amid, and atop, its sensitive, forested seaside site. Owners: A family from Vancouver, B.C. Architecture: Olson Kundig: Jim Olson, design principal; Will Kemper, project architect; Olivier Landa and Les Eerkes, project managers. 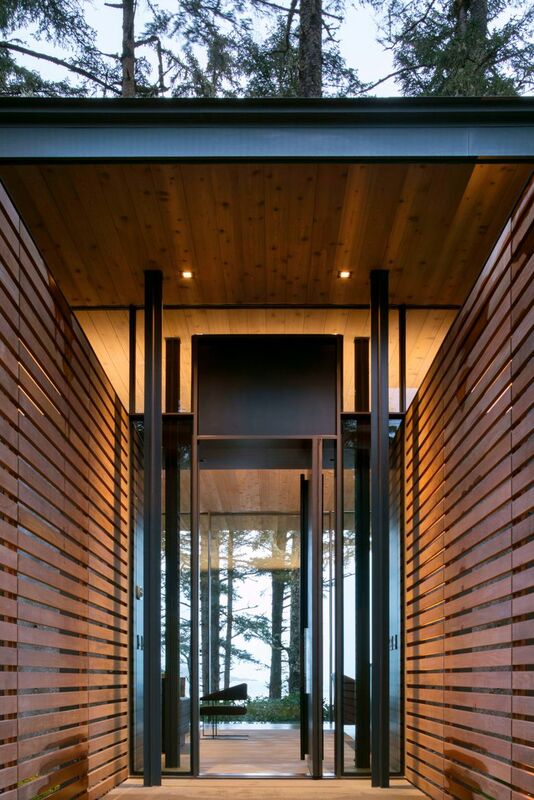 Interior Design: Christine Burkland, Olson Kundig. Mind you: When we say, “all the projects of an entire professional lifetime,” we mean nearly 300 of them over nearly 60 years — local, national and global, as residentially reverential as the stunningly efficient City Cabin in Seattle and as publicly, enviably commercial as the majestic-yet-intimate JW Marriott Los Cabos Beach Resort & Spa. Which means: The Tofino Beach House is a very special place. It’s also very Jim Olson. True to his work, and the across-the-board philosophy that shapes it, this glorious 2,500-square-foot getaway on the western side of Vancouver Island, owned by a family that loves surfing, cooking and (clearly) intensely distinctive design, respectfully embraces every element of the nature around it. 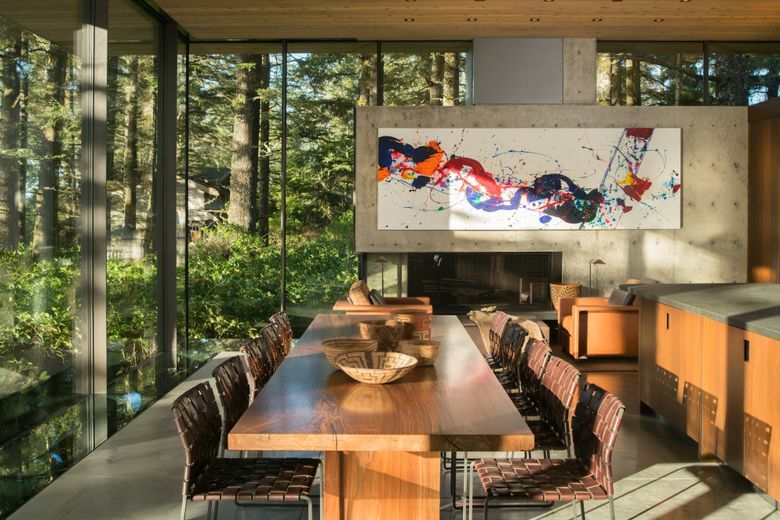 It is a livable, luminous sanctuary connecting ocean and trees, materials and technique, architecture and art. Also very Jim Olson: He designed every piece of furniture inside it, save the dining-area chairs. We spoke with Olson, a founding partner of Seattle-based architectural powerhouse Olson Kundig, about this special place; the celebratory new book that extols it on two covers (25 distinguished project profiles await inside); and a momentous career of buildings, design and discoveries. 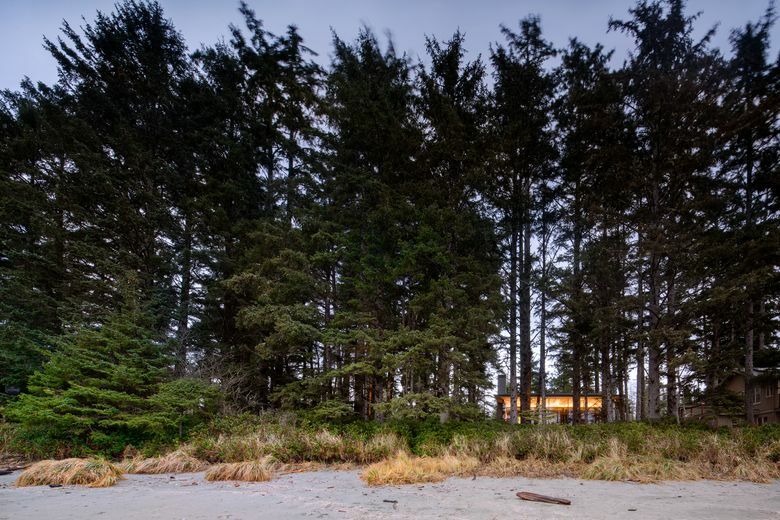 Q: How does the Tofino Beach House differ from homes you’d done previously, and does it represent any new concepts/techniques/ways of thinking? A: It’s really interesting because, in some ways, it’s very similar to the first house I ever did, when I was 18 years old: It was a house in the trees, and the whole purpose of it was to be there with nature and look outside and gently sit on the land so you hardly left a footprint at all and didn’t cut down any trees — in this case, we only had to cut one tree. It’s funny that in some ways, after all these years, I’m still the same person, and I still kind of worship the same things/admire nature in the same way. The things that are different: Every project has to me one or two new things we haven’t done before. Sometimes it has to do with the client, sometimes with the situation. In this case, we wanted people to feel as though they were outside as much as possible. We did this wall of windows but suspended it from only two points — from the two chimneys. [Project architect] Will [Kemper] had a lot to do with getting this figured out. The idea of the floating roof is to make you feel as though you’re out there in kind of a park shelter looking out at the ocean, with no windows between you and the ocean — at one with nature. The structure is part of what makes that happen. Another thing I tried: The house is sitting 6 feet above the ground, because the salal that grows on the site is so beautiful, we didn’t want to have to cut it. We just lifted the house to the height right where the salal normally stops — about 6 feet. The site is so beautiful, you can’t believe it: When you look up into the sky, you see the trees going up and the sky, looking out to the ocean, every direction in the woods. It looks like a primeval forest; the trees are so gnarly and weather-beaten because of the wind, they’re like sculpture. Because it’s raised up, we decided to do this glass floor along the edge. I had the idea; Will had to make it all work. We had never done it before. It’s so that when you’re in the house, you can look down as well as down and up. One of the surprises of the glass floor: Not only do you see the salal growing beneath you, but the glass reflects the trees in an interesting way. Sitting in the house, it appears the trees continue right down through the floor. It’s almost the illusion that the windows are floating in space. Q: How, specifically, did the site inspire or challenge the home’s design? A: We wanted to look in every direction. We originally had a garden on the roof, with a stairway to lie on your back and look up at the trees, but because of cost, we were unable to do that. Then we realized you could go in the courtyards outside and lie down and look up. Also interesting about the site: In feng shui, the best way you can face is south. When you’re facing south looking over a body of water, that’s the most desirable position to be in. 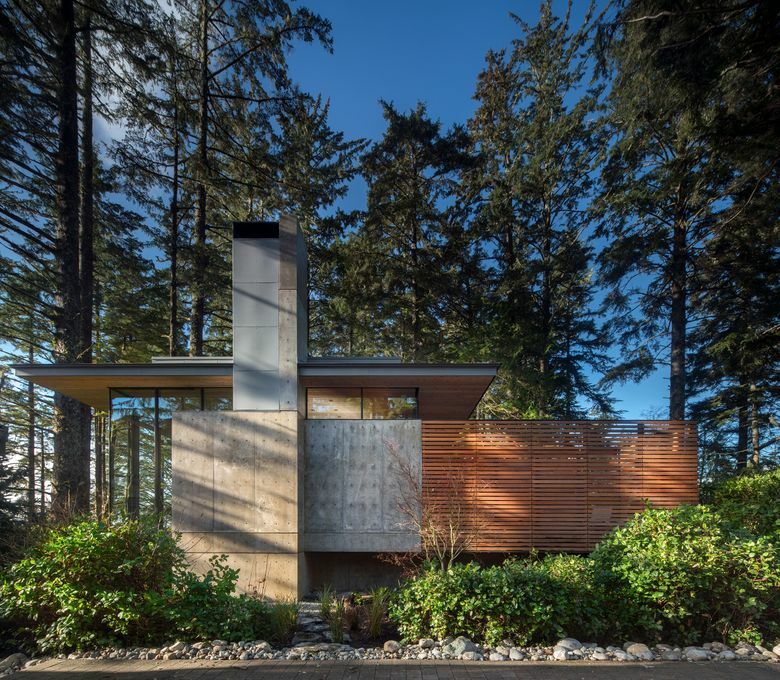 This house really does that; because it faces south, and because of the trees, it isn’t harsh sunlight — it flickers through the trees. Especially in winter, when the sun is low, the light comes right into the room. It’s like cliff dwellings: They basically face south, set so that in the winter, the sun comes right in and warms it; in the summer, the sun is up higher, and it’s in shade. A: For some reason, I’ve always preferred to weave buildings into nature as opposed to contrasting or standing out against it. I don’t know why; I just think it’s maybe because our landscape here is so powerful, with the big vertical fir trees. Maybe it’s the way I was trained, with the Northwest general philosophy of a little softer approach and being respectful of nature, not overly shocking. My first cabin does the same thing this house does. I don’t know why; it just hasn’t ever changed. When I went to Japan, I realized how much the traditional Japanese philosophy of nature is what I personally believe; I think a lot of Northwest midcentury masters are along the same lines. The holistic thing didn’t start at the very beginning. I’ve always thought of the landscape and architecture as being part of one another — gently adding to the landscape, like a bird’s nest or beehive: It’s nature, but also habitat. [As for] the interiors: After once or twice building and having someone with a different philosophy of design come in — that can just destroy what you’re doing. I decided it’s really important to me. I’ve been working on interiors; I also think of that as part of the project, and art and furniture. It isn’t enough for me to do a house and turn it over to an interior designer (unless it’s Terry Hunziker or someone in our office who happens to share my general philosophy of integrating). It’s all about how you feel in the space; the furniture is as much of that as the architecture. I always wanted to be an artist as a kid. I started working with artists and realized my feeling about art was similar to my feeling about nature: It adds something so special and strong to the architectural experience, almost something the architect is there to look at, rather than the other way around. Architecture is like a vehicle to look at nature and contemplate it; it’s the same with art. Quite often the architect frames the art so you focus your attention on it. Each piece of furniture is kind of like a little building; you design it and show it to the client, see if they like it, sit in it and adjust it — it’s a lot like architecture. It’s an art that’s about making humans both inspired and comfortable. Q: Can you please discuss the “refuge” concept — both as a getaway site, and as a state of mind/design — and, similarly, the “floating” concept? A: There’s a term called “prospect refuge” — like the cliff dwellings; that’s a good example, where people like to feel safe, and that’s refuge. And prospect — people like to look out and see what’s going on outside. Refuge is about protecting you, usually from behind. Animals do this — a cat will sit in a corner with a wall behind them. Feng shui is all about this, too. This house has glass all along the south side; it’s up high, so you feel safe. No one is going to walk past your window and look at you. You don’t feel like anyone’s coming in from behind because solid walls are all around you. They’re wood, warm, a darker color, solid; they protect you — that’s the refuge. You’re in a safe place. In my mind, there’s nothing more beautiful than the ocean; it’s like the Earth breathing. The owners have a house on the property that’s kind of a beach house that’s been there for quite a while. They’ve always lived there; their kids are growing up; they all like to go there. One thing: They needed more space. They decided to make a little house that’s like a guesthouse, but for them. Their kids can use the existing house, while they will have this house. They could use it for guests; it’s flexible. They live in Vancouver and go there all the time. They love to cook. The room is arranged so the kitchen is right in the back, the dining area in the middle, cozy seating areas on both sides. People will gather while they’re cooking and having drinks; they can open the window a little bit and have the roar of the ocean, a fireplace to warm it. It’s like a modern-day version of a campfire kind of thing. After surfing, they can go back to the other side of the house; there’s a reflecting pool that goes off from the bedroom. A little wooden platform slides out and reveals a hot tub. They can soothe their aching bones from being on the ocean and warm up. It’s a very healthy kind of surfing and loving-food lifestyle. Q: In emotional and architectural terms, what does it feel like to stand on that glass flooring with undulating plants underneath? Why is our connection to nature so vital? A: Have you ever gone on the ferry when you stand at the very front, where those two prows go out? If you stand on the very front, where you can’t see anything but the water and the air around you, you feel like a bird, out there in nature. That’s the feeling. When you’re standing on the glass floor, and your vision doesn’t see anything but the natural environment around you, you feel like you’re suspended in space a little bit. I just think humans, we’ve kind of come up out of nature — up or down — we really are creatures of nature. It hasn’t been that long that we weren’t living in the woods; they’re so much a part of us that when we feel as close as possible to it, we feel more who we really are; it’s very grounding. By removing ourselves so much from nature, I think we are a little more adrift. Whatever you can do to make that connection deeper, more meaningful, with nature, it’s really important. To me, that’s part of the emotional thing: You feel whole when you’re in nature. 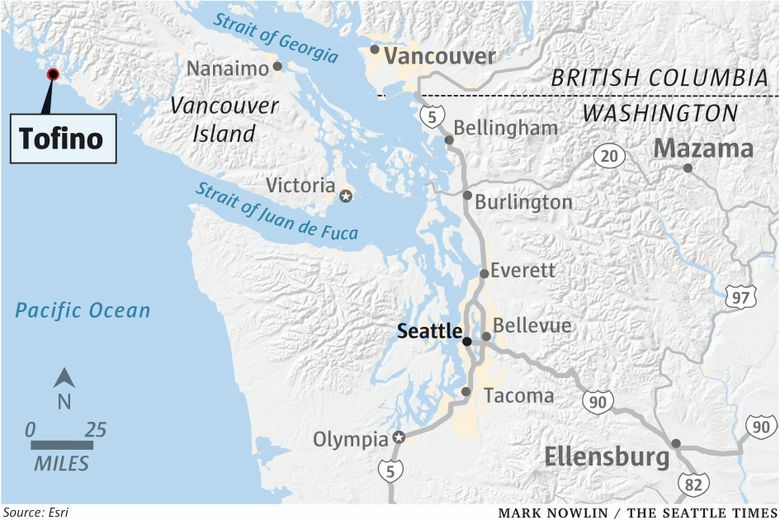 I think most people in the Northwest who go hiking, they would understand that. This could be your backyard, your planted deck in downtown Seattle; you don’t have to own a forest to do this. We have parks and all kinds of opportunity for everyone in Seattle to be part of nature. Q: What choices and materials went into the furniture pieces? A: Essentially the room itself: All around you is walnut cabinet work on three sides when you’re facing the ocean. The structure, the muscle that’s holding up this roof, is concrete, so that looks, and is, strong. The dark wood is nurturing and sort of the opposite of the glass wall; that’s completely open. 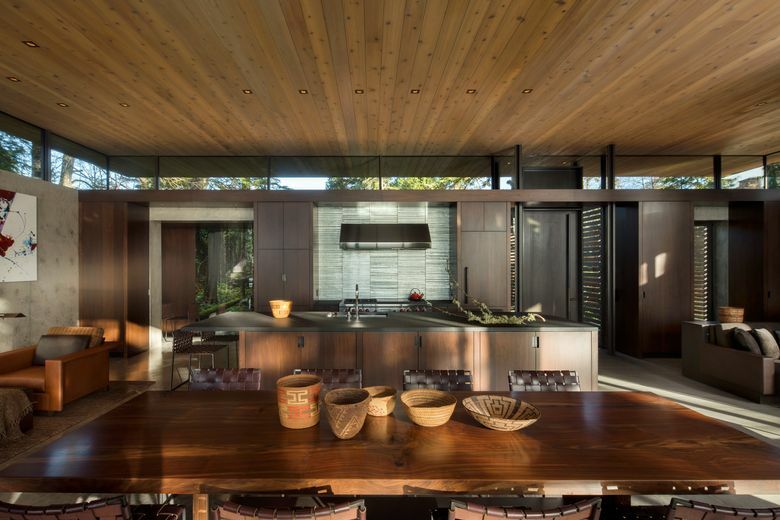 The wood ceiling is kind of nurturing: warm, natural textures. The floor is concrete, so it’s, again, like the fireplaces, it kind of anchors the house and has heating in it. Not only anchoring, but warm — you always feel this warmth from the floor and two fireplaces. The furniture is part of all that. Facing the ocean on the right, by the fireplace, are two chairs I designed that are made of leather: big, broad arms that are flat so you can set your cup of coffee, glass of wine; it’s like a house within a house. The two of them love to read; each has a little reading lamp to sit by the fire and read. Fabric mixed with leather gives a handmade woven warmth; the leather will get better with age. On the other side, the sofa comes out of the fireplace wall and is anchored: the nurturing wall. When you’re sitting facing the ocean, the sofa is like a thing you crawl up into and could sleep in. The chairs around that are on the water side, see-through: delicate and very comfortable. They have thin metal frames with stretched leather; the shape of them is very comfortable. If you’re anywhere else, you can see through them; they don’t block your view. The dining table is like an anchor in the middle; the dining-room chairs are the only piece of furniture in the house I didn’t design, including the bed. I wanted the house to be perfect. Behind the scenes, Will was making sure everything was perfect, going up and working with the builders. I thought: What would make this house more perfect? If we could design every piece of furniture so it’s exactly right. The owner was very open to this kind of thing: “Yeah; great. Go for it.” We designed everything. If there are any mistakes in the house, it’s our fault, because the client was so open. 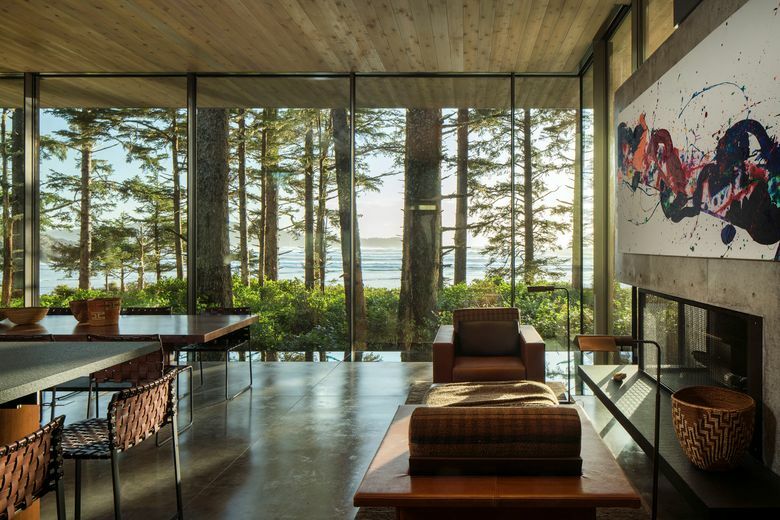 The new monograph “Jim Olson: Building•Nature•Art” (Thames & Hudson, 2018) features 25 projects designed by Olson Kundig founding partner Jim Olson, with an introduction by Aaron Betsky. Q: What feelings are evoked looking back over more than 50 years of your work through the 25 projects in the book? A: I think one thing I feel is a certain satisfaction. 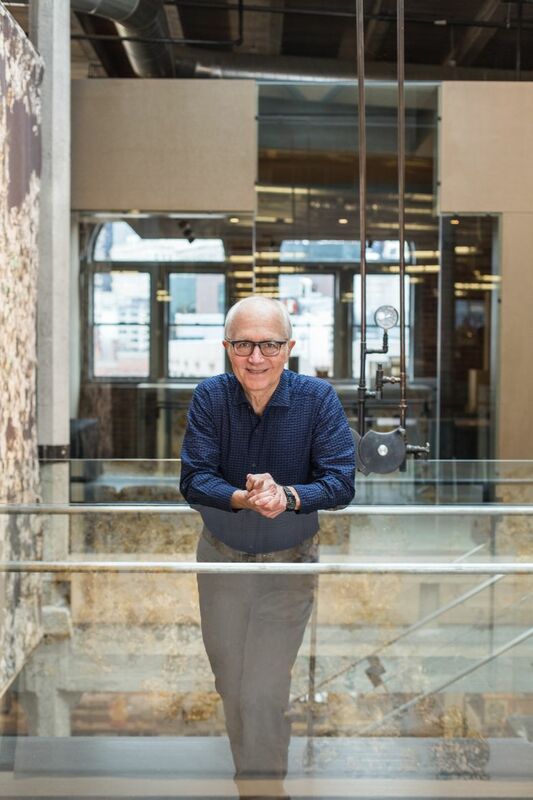 I’ve always said, “I’m not particularly hip; I’m more timeless.” The things I did early on, really the philosophy, a lot of it, is similar to what I’m doing now, but now it’s much more refined and articulated, and technology has changed. I’ve sort of taken the feeling of my very first house and just evolved it into present-day time without being part of all the different movements that came and went. I’ve never cared about any of that. I feel a certain satisfaction with it. It makes me want to do, in the future, my absolute best work I’ve ever done. I plan to keep working — I’m pretty healthy at this point. If I could stay that way, I could keep working till I’m 100. There are great people, like Will, to work with, who really get it and are excited. It’s just such a privilege or a gift to have something that you like to do so much that you just want to keep doing it forever. I always say I wasn’t really good at anything at school but art. I figured I’d better do something that had to do with art, or I’d be a loser.